The Outdoor Research Apollo Jacket is an inexpensive but fully featured waterproof/breathable rain jacket that can be used year-round for hiking and backpacking. Priced at $99 dollars, but often available for less, it compares favorably with other value-priced rain jackets like the Marmot Precip and Patagonia Torrentshell Jackets. The Apollo has a fully adjustable hood, 10″ long pit zips, velcro wrist cuffs and two side pockets, which I consider must-have features on rain jackets intended for hiking and backpacking use. But, the thing that excites me most about the Apollo Jacket is that Outdoor Research is making their well-designed and high quality jackets available to a wider, more price-conscious audience. While the Apollo isn’t as feature rich as the more technical jackets and shells that Outdoor Research makes, it’s a pretty awesome jacket and an excellent value. While the Apollo is made with OR’s proprietary Ventia waterproof/breathable laminate, I wouldn’t get too excited about that aspect of this jacket. Most Gore-tex knock-offs like it have pretty lackluster breathability performance (and OR doesn’t publish specs for theirs.) Companies use them to reduce the cost of jackets and because a breathable layer is considered a check-box feature with consumers, regardless of its effectiveness. The important thing is that the jacket is waterproof. What I like about Outdoor Research rain jackets and hard shells is that they usually put pit-zips on their rain jackets, even when they have a breathable membrane. Why not hedge your bets? After all, venting is the most effective way to dump the excess body heat that leads to perspiration. Furthermore, I’ve never had much faith in the laboratory-tested breathability claims made by any manufacturer and their applicability for field use. All of the rain jackets and winter shells I use when I’m not testing gear have pit zips or torso-zips for that reason. The Apollo Jacket has a fully adjustable hood with side neck toggles and a rear volume reducer, so you can adjust the hood to fit closely around your head. Your head generates a lot of heat when you hike and it’s important to retain it when you’re cold or vent it when you’re too warm. You can’t do that if you can’t cinch the hood down tight and prevent the wind from whistling in. I have a small head, so this is a dimension that I am particularly keen on. Hood controls let you shrink the hood volume to prevent heat loss, while a high collar protects your neck and face. A high collar helps protect your face from wind and spray, but there are a few things missing from the hood that more expensive jackets often have. For example, there isn’t a chin and face liner inside for greater comfort or a garage (a small cavity) at the top of the zipper to keep it away from your whiskers. The hood also doesn’t have a wire brim to help keep the rain out of your eyes and off your glasses. The Apollo hood is still quite workable, but those are some of the luxury features that often get dropped on less expensive rain jackets. The Apollo has 11″ long pit zips under the arms with one-way zippers. They’re easy to reach and unzip while wearing the jacket and do a good job at dumping excess heat without letting in additional moisture when it’s raining. Again, they are one-way zippers, and not two-ways zippers, but they work well enough. The Apollo’s arms have hook and loop wrist cuffs that you can cinch closed to prevent heat loss. You have a lot of blood flowing through the wrist that’s close to the surface of your skin, so preventing cold air from reaching it is an important way to keep your hands warm. They also prevent cold rain from dripping down your arm and wetting your mid-layer. The Apollo Jacket has two zippered pockets, both lined with mesh. Both pockets are enormous and can hold lots of gloves, hats, or snacks. The left pocket also has a key fob inside, which is a nice add. Unfortunately, the side pockets are not hip belt compatible and will be covered if you’re wearing a backpack. More expensive jackets have hip belt compatible side pockets or a additional chest pocket. The side pockets are quite tall and zip close for secure storage. There are some other advantages to wearing a 70 denier nylon rain jacket. First off, it will be warmer than a “thinner” jacket or that “little red 7 denier nylon jacket you’ll been lusting after with the racing stripe down the back.” This can be a good thing in cool weather, like in spring, autumn, and winter, when you want to stay warm. A 70 denier ripstop nylon jacket will also be significantly more puncture resistant if you hike off trail in dense vegetation, which will rip a lighter weight jacket to shreds. But specs aside, I haven’t been able to detect any kind of noticeable weight or agility difference between wearing the 70 denier Apollo rain jacket over a 50 denier rain jacket. 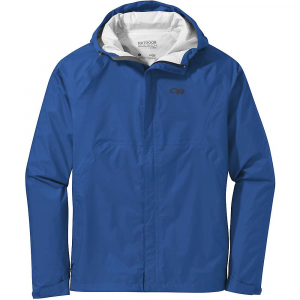 At 12 oz, the Apollo is a comparably lightweight rain jacket, as well. The Outdoor Research Apollo Jacket is a comfortable and well featured rain jacket that can serve double duty as a winter shell. It is well featured with all of the capabilities that you’d expect in a technical shell, but at a fraction of the price because it uses OR’s proprietary breathable layer and not more expensive Gore-tex. If you believe in manufacturer’s breathability claims, go buy a more expensive jacket. But if you’ve never been able to detect any noticeable difference, or you beat the crap out of your rain jackets by wearing shoulder straps and hip belts (ie backpacks), the Apollo will provide as much value as a more expensive jacket. Outdoor Research makes the best hiking rain gear in my experience and the Apollo Jacket is another great product. 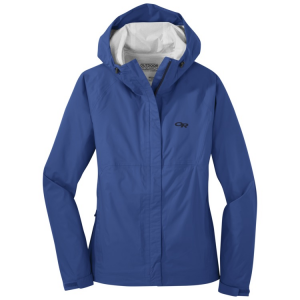 Outdoor Research provided the author with a jacket for this review. Great review as usual, thank you. One thing about OR is that they have the best warranty service of any manufacturer (outdoor or otherwise) I’ve ever dealt with. How loud is the material? I love my arcteryx gore pro jacket performance but dislike the crinkle. I gush about their warranty as well. Fantastic company to deal with at every level! The jacket is quite quiet, actually. I’ve been wearing it this spring and it’s a perfectly nice jacket. Did you find it necessary to go a size up to allow for a base layer (fleece)? Love your blog also! Good question. No actually. I was pleasantly surprised by that. I normally wear an XL, but I could fit a fleece under a large Apollo just fine. I bought the OR Helium 2 as well as the more expensive OR Realm based on your reviews and found them to be excellent. It wet weather hiking/backpacking I bring them both so I have a dry one to wear at all times. I also have the OR Sombrero hat for wet/cold weather. OR makes great quality products, well designed at reasonable prices = unbeatable value!